MUKALLA, Yemen (AP) — Hundreds of men swept up in the hunt for al-Qaida militants have disappeared into a secret network of prisons in southern Yemen where abuse is routine and torture extreme — including the “grill,” in which the victim is tied to a spit like a roast and spun in a circle of fire, an Associated Press investigation has found. Senior American defense officials acknowledged Wednesday that U.S. forces have been involved in interrogations of detainees in Yemen but denied any participation in or knowledge of human rights abuses. Interrogating detainees who have been abused could violate international law, which prohibits complicity in torture. The AP documented at least 18 clandestine lockups across southern Yemen run by the United Arab Emirates or by Yemeni forces created and trained by the Gulf nation, drawing on accounts from former detainees, families of prisoners, civil rights lawyers and Yemeni military officials. All are either hidden or off limits to Yemen’s government, which has been getting Emirati help in its civil war with rebels over the last two years. The secret prisons are inside military bases, ports, an airport, private villas and even a nightclub. Some detainees have been flown to an Emirati base across the Red Sea in Eritrea, according to Yemen Interior Minister Hussein Arab and others. Several U.S. defense officials, speaking on condition of anonymity to discuss the topic, told AP that American forces do participate in interrogations of detainees at locations in Yemen, provide questions for others to ask, and receive transcripts of interrogations from Emirati allies. They said U.S. senior military leaders were aware of allegations of torture at the prisons in Yemen, looked into them, but were satisfied that there had not been any abuse when U.S. forces were present. In a statement to the AP, the UAE’s government denied the allegations. Inside war-torn Yemen, however, lawyers and families say nearly 2,000 men have disappeared into the clandestine prisons, a number so high that it has triggered near-weekly protests among families seeking information about missing sons, brothers and fathers. A Yemeni officer who said he was deployed for a time on a ship off the coast said he saw at least two detainees brought to the vessel for questioning. 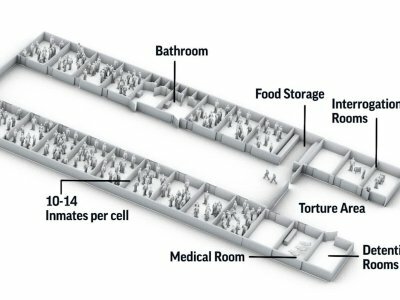 The detainees were taken below deck, where he was told American “polygraph experts” and “psychological experts” conducted interrogations. He did not have access to the lower decks. The officer spoke on condition of anonymity because he feared retaliation for discussing the operations. Senior U.S. defense officials flatly denied the military conducts any interrogations of Yemenis on any ships. “We have no comment on these specific claims,” said Jonathan Liu, a CIA spokesman, adding that any allegations of abuse are taken seriously. wolves should eat more beef, while the cow recommends a diet of pork. How to create a terrorist? Roast him on a spit. That should burn any humanity out of him. That's how I feel too. How can they ever forgive us? What kind of monsters are these? What kind of monsters at the UN turn a blind eye to this? I am thankful this empire is dying. It needs to take the UK empire along with it. The empire is dying and wants to take everything with it! !